I have a little card to share with you! share a little something else with you! This is for a work colleague, who was promoted. been doing her new job for a while already! snippets of vibrant pink & orange papers from my stash. The green leafy paper is from Lidl! The sentiment was made in my graphics programme. I cut it out with a circle nestie then inked with a liquid chalk ink pad. The chipboard Butterflies are by Dovecraft I think. I added a couple of gems from my stash! I'm hoping it's funky but not too out there! This is fabulous and love the gorgeous colours. 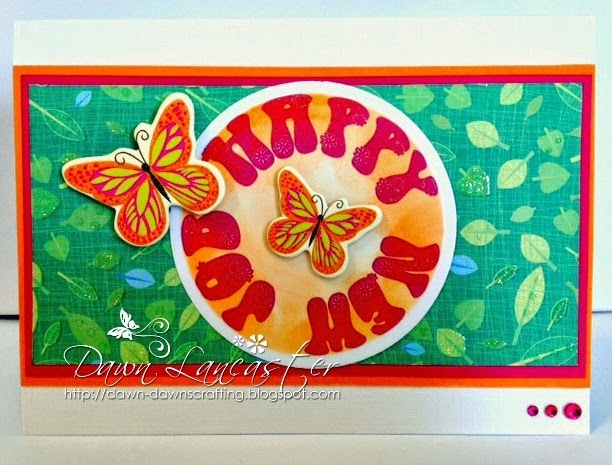 A fabulous card Dawn, lovely bright colours. Super card Dawn. Great image and design and love the bright colours. I cannot thank you enough for playing along with my Dream Team and me on the launch of our new ATG challenge blog! Again, thanks for joining us for our current ATG challenge. Hope to see you again and good luck! Great way to let a colleague know you're cheering for them! Love the colors! ist is a good idea! thank for playing with us by inspiration destination and good luck!!! Great card! Thanks for joining us at The Crazy Challenge. What a great card! So retro and I lived through retro! So bright and cheerful. Thank you for joining us over at the Scribble and Scrap Challenge. Good luck. 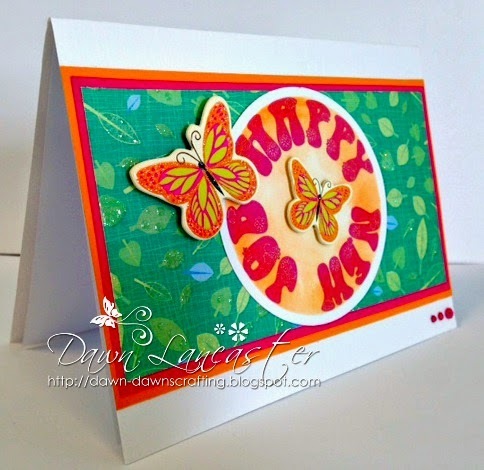 What great bright colours on this card brill. A wonderful card for your colleague. I love the bright, cheery colours. 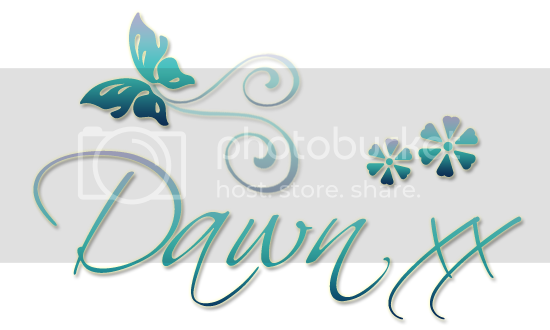 Love the bright colors, Dawn! Great design and superb background paper. Lovely and simple card! Thank you for joining us this week at the Crafty Sentiments Designs Challenge! We hope you play along with us again soon!